A different post than my usual. This one just has some odds and ends—some to help with life on the road, others as job aids. Don’t do a walk-around while on your phone. It doesn’t look good, and passengers notice. So might your boss if he or she is in the terminal. Passengers will take a picture of you and send it to your boss. It’s OK to use your phone to take a picture of a potential maintenance issue to show the captain or send to the main maintenance folks. In a pinch, you can use the flashlight feature on your phone if it isn’t too dark. But don’t do your job while talking on your phone. It’s a sure-fire way to a chief pilot carpet dance. Know the difference between transition level and transition altitude. Use the “V” and the “A” to help. “V” points down, so transition le”V”el is the point during a descent when you switch from standard altimeter settings to the local altimeter setting. “A” points up, so transition “A”ltitude is the point at which you go from local to standard settings. In the United States, the transition altitude and level are the same (18,000 feet). But in Mexico, the transition level is 19,500 feet, and the altitude is 18,500. Aruba has an even greater discrepancy: The level is 4,000 and the altitude is 2,500. The data is printed in small print on the approach charts and SID and STAR charts. Keep pictures of your important documents, such as your passport, company identification, et cetera. Losing one of these can create monumental headaches, and photos can help smooth some feathers. Store the pictures on the cloud or on your phone (if you feel comfortable doing so). If you do a lot of international flying, including Canada, Mexico and the Caribbean, memorize your passport number. If you use a company iPad or similar device, take a picture of your ID on a white background that also has your phone number. Make that picture the first thing someone will see when they hit the home button. That way, if your device is lost and someone finds it, they can find you ASAP. You could also include an email address or other information you feel comfortable disclosing. Use multiple alarms. Don’t count on wake-up calls, as they frequently don’t get entered into the computer. Worse, they sometimes get entered for the wrong room. If you’re going to use the alarm clock in your room, pay attention to AM/PM and DST settings, along with the volume. If you need to go to bed when it’s light out, or want to sleep in after the sun comes up, use the pant-clip hangers to clip the curtains together to keep the light out, and make sure the previous guest doesn’t have the alarm set for 3 a.m. when you aren’t planning to get up until 10 (ask me how I know this). Always carry a 10-foot phone charger. Some hotels still don’t have convenient outlets near the bed. If you want to put food in the fridge to keep it fresh, put one of your work shoes in the fridge with it, so you don’t forget the food the next day. If you’re getting ready for your first job in a turboprop or a jet, you’re about to get introduced to the quick reference handbook (QRH). The QRH has all of the abnormal and emergency checklists in it, based on the equipment and furnishings on the airplane. At the very least, the manufacturer-designated checklists will be included, but often the company or operator will include its own procedures. This book is kept on the flight deck. QRHs are usually written in some kind of an outline or flow-chart like format, with the intention of minimizing confusion for the pilots. However, lawyers are also involved, as are government representatives, and confusion still finds a way to rear its ugly head. Sometimes the confusion is difficult to avoid because the checklist has to work its way through several potential scenarios to troubleshoot and isolate a problem. Electrical and smoke issues are good examples. Some engine problems can be as well. Adding to the problem are stress and compressed time. It’s very easy to write a checklist sitting at a desk or in a procedures trainer. It’s something different to determine how things will play out when the actual emergency is underway with a crew or a pilot that may be (pick a few) inexperienced; tired; scared; asleep; undisciplined; poorly trained; or sick. I’ve never seen a QRH that is perfect, and I doubt I ever will. In fact, just turning the page can be an issue. Some QRHs have different options based on what is occurring, and when a page is turned, it’s possible to lose track of which flow of information you’re using. More and more crews are using electronic flight bags, but there are plenty of paper QRHs still on the flight decks. Paper doesn’t break or require electricity to use, and some books are just too hard to manipulate or use on a tablet, since you can’t mark several places with your finger. The key to QRH use is to understand the layout of the book, and to use it exactly as intended. Don’t go beyond the scope of the particular problem you’re trying to solve. Too often, you’ll just make the situation worse. When the QRH says to “confirm” something, that almost always means asking the other pilot to verify that you have the correct switch or engine. More than once, I’ve seen a pilot shut down the wrong engine in a sim because he rushed and didn’t give me a chance to verify the correct engine was about to be secured. Sometimes, the manufacturer will put a checklist in one chapter of the QRH when logic would dictate that it should be in another. For example, some engine issues are addressed in the chapter that deals with fires. Occasionally, a message that indicates as an abnormal is addressed as an emergency in the QRH. For the most part, all you can do is roll with it. Changing a QRH is daunting, but not impossible. The aforementioned lawyers and bureaucrats want their say, but when real-world experience dictates, QRHs get changed. And that’s another challenge: It’s important to be at least tangentially aware of those changes. Every month it seems that more evidence comes out about how extreme the pilot shortage is getting. I got an email tonight that was as clear as could be that it’s getting worse. ExpressJet Airlines, which at one time was the regional feed for Continental and is now owned by SkyWest Airlines, has been struggling for awhile to find enough qualified pilots to staff its airplanes. The union leadership at ExpressJet and ASA (also owned by SkyWest) has agreed to allow the company to hire pilots with previous FAR 121 experience and pay them based previous years of service. That means that a former Comair pilot with 15 years of experience can get hired and get paid at year-10 pay. The news release doesn’t get very specific, but since ExpressJet only has an eight-year scale for first officers, it could mean that the 10-year pay includes captain time. Still, this is a huge step. It’s an admission that current recruiting efforts for pilots are not bearing any fruit. To take that a step further, it’s of even greater significance that the union agreed to this, because this practice goes against almost 100 years of industry norm. It has the potential to ruffle some feathers among the pilots on property, but—in theory—it shouldn’t, since those hired previously are still getting paid based on total experience. If I read the press release correctly, pilots who were previously hired and would have met the requirements to get paid more will also get a pay bump. The only catch to this new rule is that the new-hire pilot is required to have left his or her previous carrier on good terms. In other words, it’s OK to have been furloughed or to have resigned, but if you were fired, you’re out of luck. There’s virtually no chance of this sort of deal coming to fruition at the majors, since the number of pilots applying for those jobs far exceeds the number of jobs available. It also helps that the pay at the majors is also substantially greater than the pay at the regionals. Just about every airline or corporate flight department—and for sure the military—has a certain number of checklists that are considered to be memory items. That is, they are considered so important that, when needed, the pilot doesn’t have time to look up the checklist and go through it line by line. Therefore, the checklist must be committed to memory. Some of these are fairly obvious, such as certain fire warnings, sudden cabin depressurizations, or a rejected takeoff. Most of the time, the carrier determines the checklists that are designated as memory items, and there is usually a bias toward certain items based on the experience of the company, or of the fleet manager. Sometimes, the memory items are determined by one of the local FAA oversight personnel—again based on his or her past experience and/or unfamiliarity with a particular airplane—and sometimes by the manufacturer. Some carriers take things overboard and have far too many memory items. But what about non-memory-item checklists? Are any that are not memory items actually memory items? Yes. A common example is the rejected takeoff. Some operators have a specific rejected takeoff memory item that includes checking or manually deploying the handle, and thus the speed brakes. This shouldn’t really be necessary, because you can feel immediately if the speed brakes have deployed, but somewhere, somebody decided this is a good idea. And so it is. Another non-memory-item memory item is the wind-shear recovery procedure. Again, this is something that is occurring in a fast-paced, dynamic environment, close to the ground. Considering the severity of the situation, it isn’t the time to be pulling out a manual to look something up. Generally speaking, a memory item is something that you only have one chance to get right, and survival may depend on the outcome. But, as I mentioned, airlines can go overboard with this as well. At my first carrier, we had to memorize an unnecessarily complex emergency evacuation procedure that was too easy to mess up, and would have been difficult to perform correctly in the stress of an emergency with adrenaline pumping and your mind racing. A good memory item is one with only a couple of steps, and when possible, it is similar to other checklists to ease its recall. However, the procedures that are not necessarily referred to as memory items but need to be committed to memory are just as important. Learn them, commit them to memory, and review them, so that when you need them, your performance is flawless. As I write this, we are only a few days removed from the in-flight engine failure on Southwest 3472, a Boeing 737 that experienced an uncontained failure of the left engine just after reaching its cruising altitude. While the cause of the incident is far from being determined or disclosed, one thing is clear: The pilots did a great job of getting the airplane on the ground safely as quickly as possible while complying with the appropriate checklists. Larger airplanes generally have a book called the Quick Reference Handbook (QRH) on the flight deck to deal with certain emergency or abnormal conditions. Printed by the manufacturer initially, the book can be modified to a degree by the operating airline with the consent of the manufacturer and the FAA. The modifications usually take into account certain equipment configurations and/or operational experience that leads the airline to think there may be a better way to execute a certain procedure. The QRH is usually compartmentalized in one of two ways. The first is to have all of the Emergency procedures in one section, subdivided by the various systems (usually alphabetically). The Abnormal/Caution section then follows, also broken down by each aircraft system. The second method is to simply list all of the systems in alphabetical order and then spell out the various procedures within each chapter. Emergencies will still be first, followed by an alphabetical listing based on the problem or indication presented to the crew. The checklist will then go through a process of confirming what problem has been presented, and then a series of corrective actions is presented. This will be often be followed by some IF/THEN scenarios that talk the crew through troubleshooting. The IF/THEN steps can be confusing, and a tremendous amount of time is dedicated to minimizing the possibility of mistakes. In a case like the one of SWA 3472, the crew would have run a Severe Engine Damage procedure that would have had them systematically prevent further damage by shutting down fuel flow to a potentially burning engine. Once the engine (or what was left of it) was secured, the next step would be getting the auxiliary power unit (APU) started. The APU is a small turbine engine in the tail of the airplane that has a generator for providing electricity and air conditioning. While it’s primarily used on the ground, it is designed to be a back-up source of electrical power in flight. Once the emergency is stabilized and an appropriate destination is determined, the next step is getting the airplane properly configured for a single engine landing. Fortunately, this is driven home in training, and for each airplane, the setup is pretty consistent. In the 737, the flaps will be limited to 15 degrees, as opposed to the usual 30 or 40. The 15-degree setting greatly improves performance in the event of a single-engine go around. Approach speeds will be computed accordingly, and they will be higher. All of this could affect which airport might be suitable for the landing. An airport that the airline already serves as the alternate is always the first choice, but it isn’t always the best choice. A suitable airport will be one that has crash/fire/rescue capability, but it may not be a station for your company, and while that can create some logistical nightmares, passenger, crew, and equipment safety is the most important consideration. A common question among airline new-hires concerns the probationary year. What exactly is probation, and how does it work? Because the airlines are heavily unionized, terminating pilots—even for cause—is not always easy. The union will appeal the termination, and more often than not it is able to get the pilot reinstated. But when it comes to new hires, the rules are a bit different. Airlines make a significant financial investment in recruiting and training a new-hire pilot. The up-front cost to get a person line-qualified can easily approach $100,000. It’s fair for the company to have an opportunity to evaluate whether that pilot is a good fit. Probation usually covers the first 12 months of employment, assuming no disruptions such as a furlough or family emergency that require time off. A pilot on probation has no recourse if the company invokes termination. But probation is really not as big a deal as people make it sound. Because the industry is seniority-based, and because employee numbers tend to be chronologically assigned, it’s pretty easy to figure out when you’re dealing with a newbie on probation. The easiest way to survive that probation is to simply make sure that nobody knows who you are. If you show up on time every time, don’t call in sick, and follow company procedures, you have nothing to worry about. Being on probation is sort of like checking in with ATC and saying that you are a student pilot. By that I mean is that most captains and fellow first officers will want to do whatever they can to help you. They will gladly answer any questions, show you some tricks of the trade, and help make your life just a bit easier. In fact, you will usually suffer from information overload, and that’s a good thing. If you are in training with the intention of moving on to the airlines or corporate opportunities, have you thought of trying to train and fly as you would for the job you eventually want to have? Or even if you aren’t planning on flying the “heavy and fast” metal? It’s not as hard as you think. One of the easiest things to do is to develop an almost sick obsession with checklists. Most people, including general aviation pilots, would be surprised at the level of checklist discipline that airline pilots use. It starts at the gate, usually with a checklist for “Accepting” or “Receiving” the airplane, and it doesn’t end until the airplane is shut down or handed off to either maintenance or another crew. Some of the checklists are ridiculously long, and some are absurdly short. It doesn’t matter. They all have to be done, in full, every time. 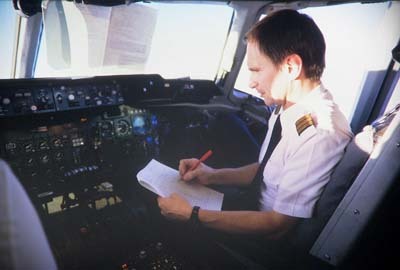 Moreover, many are required to be done verbally so that the cockpit voice recorder can be used to verify that the checklist was done in the event of an accident. The rote process of doing checklists becomes ingrained, and it gets to the point of, quite literally, physical discomfort when one is not completed (not to be confused with what happens when one is simply forgotten). When I was flying for a regional airline, we had a checklist on a turboprop that we had to complete when passing 18,000 feet. It consisted of changing the settings of the propellers (to reduce noise) and setting the altimeters to the standard of 29.92 inches. Two items. That’s all. But it would create a lot of angst if someone didn’t get it done on time or was unable to complete it on time (usually because of radio chatter). We had a couple of similar checklists on the CRJ. In addition, we had a few that were quite wordy, and they’re even worse for inducing a bit of anxiety, because they seemed to be so prone to interruption at the worst possible time—which often meant starting over. Airline and military pilots don’t let the rush to get home or to the hotel distract them. The checklists are completed the way in which they are supposed to be completed, every single time. They have to be. As I said, the CVR records them, and if we make a mistake, our careers depend on them. I’ve been in situations in which we had very little time to get out of the gate and get to a runway before we would run the risk of not being able to complete the flight, but every checklist still had to be finished. It’s just the way it is. Sometimes the checklists get rushed a bit, but they do get done. In your training, develop the same mindset. It doesn’t matter how “obvious” something is, or how “simple” an airplane is. Get in the habit early. Not only is it a good one, but it might save you from embarrassment later. It might be something as simple as turning on a transponder or as important as making sure the landing gear is extended. You’ll find that when you don’t complete the checklist, you’ll be squirming in your seat until you do, and when you finally complete it, you’ll suddenly relax. One of the common problems in aviation is that of routine and repetition. It’s easy to assume that because we do certain tasks every time we fly, with no change, that perhaps those tasks don’t need to be completed every time we fly. Two examples come to mind: the preflight check and the flight control check. When you rent an airplane from a flight school, it’s tempting to avoid the preflight or walk-around, because you know the airplane flies every day (or close to it). It’s even more tempting to skip it when you watch the airplane land (or even do a few touch and goes) and then taxi to the tie-down spot. I mean really, it just landed! What could you possibly miss? A lot, actually. The other pilot might have missed cord showing on the tire because that cord may have not been showing when the flight started, or it was on the bottom of the tire, out of sight, when he conducted his own walk-around. It’s also possible that there might be damage to the airplane from an unseen bird strike, such as a missing antenna, which the previous pilot might not have noticed if he wasn’t using that particular radio. Fluid leaks also are possible. Flight control checks are another area in which it’s easy to get complacent. As a student, you’re told that you are checking for flight control functionality and proper rigging (making sure the controls deflect in the proper direction). This is especially true if the airplane has been in maintenance. But there is also something else to test for, which is a general feel for the controls. If you fly the same airplane enough, you will know when it just doesn’t “feel” right, and you should learn to trust that little devil on your shoulder. I’ve experienced two examples of this. The first was about five years ago on the CRJ. The flight controls were the first officer’s responsibility. One day, my FO immediately said something as he was checking the elevator. What happened next is a long story, but the gist of is that the airplane was broken. It stayed in Richmond for four days, and the tail was basically rebuilt. It took the mechanics 10 pages in the logbook to record all of the work. Recently, an airplane I was flying had a funny feel to the rudder pedals when the captain checked them. The mechanics were never able to quite duplicate the sensation, but they kept digging and eventually found a failure of a part in the back of the airplane. The flight was cancelled and the airplane was sent to the hangar for repairs. It’s happened again. There’s been another accident, this one involving Air Asia. The airplane was en route from Indonesia to Singapore on Dec. 28, 2014, when it crashed into the Java Sea, killing all 162 people on board. And, as usual, speculation about the potential cause(s) was immediate and rampant. Some of it was the picture of basic ignorance about aviation. One newscaster was audacious enough to ask if the use of the metric system (for setting the altimeter) might have played a role in the accident. Where do they find these people? In this case, the immediate culprit of suspicion was the weather, because people could access the satellite images that were taken at the time of the airplane’s disappearance. The crew in this accident was very experienced, especially the captain. If this was indeed a weather- related accident, it makes you wonder right away how the crew could have allowed themselves to get into that situation. This is a great reminder of what we try to drive home to student and private pilots, not to mention instrument students and pilots, every day: You’re only as good as your last good decision. Penetrating bad weather of any form is a bad idea. Thunderstorms are violent, and they can destroy the best airplanes with surprising efficiency. Flying in precip in freezing temperatures can easily overwhelm a plane with ice, which can not only destroy lift, but add a crippling amount of weight. It’s important in this accident, as in all others, to allow the experts the latitude to do their jobs and go wherever the evidence leads them. That’s especially true if or when the evidence starts to paint a picture that sullies the reputation of the crew of the plane or the engines or whatever component is involved. When it comes to safety, facts and information are far more important than reputation. That isn’t to say that anybody should just pile on to the pilots and blame them. Far from it. But all other evidence needs to be excluded. I have my own theories about what might have happened, but I’m keeping them to myself. One of the difficult facts to reconcile is that I can think of a number of scenarios that might have developed, but they are all very remote, with highly improbable odds. But that’s the case in any accident: Invariably, something happens that shouldn’t have, or the accident would not have occurred in the first place. My only wish is that the NTSB were involved. They are the best in the world at what they do, and they do a very good job at maintaining impartiality until they have a true bead on the cause. Politics will likely rear its ugly head, and various entities will do whatever they can to shift the blame. To think otherwise would be naïve.